What does it take to become one of the largest and most renowned multi-specialty transplant centers in the country? For the Baylor Annette C. and Harold C. Simmons Transplant Institute, it’s been more than thirty years of pioneering transplants. It’s a program that started fast in 1984, with a liver transplant for a sick little girl from Indiana, 5-year-old Amie Garrison. 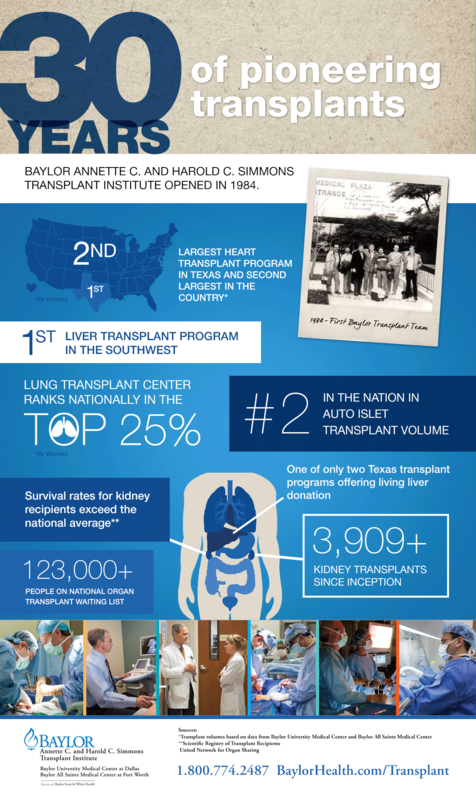 Today, the Baylor Simmons Transplant Institute is one of few programs in the nation to perform over 11,700 organ transplants. It is one of only two Texas programs offering living liver donation and has the second-largest heart transplantation program in the U.S. But why are these numbers significant? Studies suggest a correlation between transplant volumes and success rates for some procedures. The transplant program at Baylor University Medical Center at Dallas and Baylor All Saints Medical Center at Fort Worth is living proof that the more times a hospital performs a procedure, the better its success rate. The Baylor Simmons Transplant Institute continues to prove that there is strength in the numbers. See for yourself. Blogger Steve Jacob contributed to this post.